I chose Cardiff University to study Biomedical Science not only because Cardiff is a great city but also because, crucially for me, it has a full-time judo academy. Although Olympic qualification is a huge ambition of mine, from a young age my aim was to be a Commonwealth champion. The Commonwealth Games are extra special for Welsh athletes because it is the only opportunity you get to represent Wales. So winning gold in 2014 was a dream come true, making a few tough years balancing studies with full-time training more than worthwhile. I was even able to take a year off from my studies to prepare, something which would not have been possible without the University’s support. Such a huge result gave me a massive confidence boost. 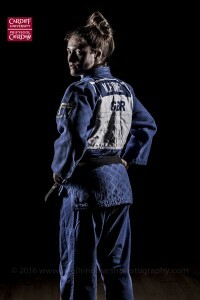 Overcoming the Olympic silver medallist, Gemma Gibbons, in the final made my dreams of going to Rio far more realistic. Qualification for the Olympics is decided over a two-year period, with the top 14 players in the World Rankings at the end of the period making the Games. The catch: only one person from each country can be selected in each weight category. However, I have won numerous Grand Prix medals and my best result came in May 2015, when I won a silver medal in the World Masters Championships in Rabat, contributing to my current placing of eighth in the rankings. It’s something I’m looking to improve further in time for the selection date in May. Six years after coming to Cardiff, I’m still based in the city. I train full-time at the Sport Wales National Centre and, having finally graduated, I am now able to focus solely on judo which I hope puts me in good stead for Rio.